Club meetings on the second Tuesday of the month at the Aurere Clubrooms at 7.30pm. CLUB CLEANING ROSTER 2018-2019 During the month, and preferably before the main calendar event, please give the clubrooms a thorough check over, as in: Clean the toilets and hand basins, check kitchen, window ledges etc, and sweep the floors. Window cleaning, washing walls etc will be done at working bees. Note any required maintenance and pass on to the Building Officer- Peter Mason, ph 406 1409. If your date doesn’t suit you, please swap with someone else. For any other enquiries please contact the Club Captain. The Brian Parker Memorial Rally Saturday 13th April A day on the Road, a Challenge And a Trophy to be won Meet at Mangamuka Bridge at 11.30am Bring your lunch and afternoon tea Entries close Friday 5th April Entry form in this newsletter Far North VCC Clubrooms will be open after the rally, with tea and coffee available and a chance to freshen up. Dinner has been moved to the Mangonui Cruising Clubrooms, Silver Egg Road, Mangonui. Clubrooms and Bar open from 5pm. Club meetings are on the second Tuesday of each month, at 7.30pm, at the Aurere Clubrooms, unless otherwise advised. The Far North Branch of the VCC does have a policy that pets are not brought to any Club events. We do ask that this policy is respected. I was tired and had just reached that almost asleep moment when my teenage daughter let out a terrifying wail. Our normally placid cat had caught a mouse and both were under her bed. This woke her room-mate, my son’s girlfriend, who added to the din. Realising I had to do something before the neighbours complained, I called my son away from his usual position in front of the television and told him it was his problem: his sister, his girlfriend and his cat. He dealt with it promptly by sending in his dog. From the Chair……. March has been a busy month for our Branch. Terry and Sue’s rally focused on the Marsden Cross memorial and certainly lived up to expectations. Our members excelled with the walk, and the organisers had put a lot of thought and effort into the format of the day. A big thanks to you both. 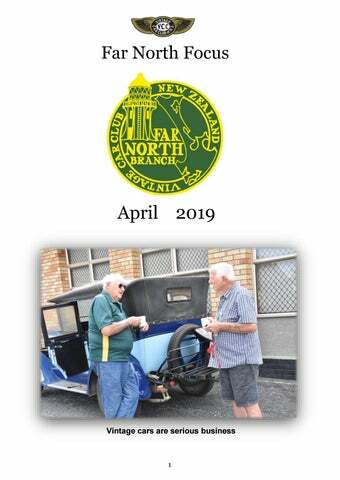 The Noggin’n’Natter and pot-luck dinner events provide great social occasions, and the monthly Caffeine’n’Classics at Taipa provides further interaction for car enthusiasts. Our southern members are planning a beach picnic prior to month’s end. A very successful working bee was held at the clubrooms involving scrap metal collection and painting. The Rover Car Club’s visit to Winston’s museum was a great success. The two-day Kaipara Cruise was most interesting and enjoyable. I was personally humbled by its size and my ignorance of its details and history. requested by 30th April but no date has been set for acceptance. Total paid-up membership of NZVCC at 28th Feb stands at 8445, slightly down on 8483 at the same time last year. Our own branch numbers at the same date were 111. Thank you for your continued membership. 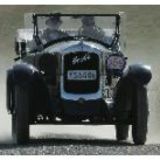 Following the success over many years of the midwinter Irishman’s Creek Rally in the lower South Island, a North Island equivalent is planned for 2020. Watch Beaded Wheels in the future for this. This year our Brian Parker Memorial Rally on 13th April looks really interesting and is sure to be a great event. I would encourage your participation. A big thanks to those organising this special club trophy rally. Well groomed Rovers at Matthews Museum on the 7th of March. TERRY'S HISTORIC ADVENTURE 12 cars (two moderns and a great variety of older cars including the Jefferies all the way from Dargaville in their newly restored Big Seven Austin (which is quite small! ), arrived at the Kaeo museum full of expectation for an adventure and we certainly were not disappointed. We were given a map from which to choose one of three possible routes which would take us to the Rangihaua Heritage Park. We chose to take Kapiro Rd on to Purirua Rd which became gravel on to Rangihaua Rd through some beautiful farm land which was originally Subritzky/ Purirua Station country, then , with huge views over the Bay of islands, on to Oihi Rd and the destination car park, Rangihaua Heritage Park which was opened in December 2014 to commemorate the bicentenary of the landing of the first European settlers. Loaded with chairs and picnic gear, we took a short walk to a very imposing look out shelter, Rore Kahu, built with rammed earth with a large steel sunshade supported by very substantial steel poles. The view down the valley towards Marsden Cross and the sea was amazing. After lunch and much chatter we set off for the walk to the Cross. This was a well formed path with information panels on the way telling the history of the first missionaries who set up home in Rangihaua Bay. It was very easy to visualise a substantial settlement (the first permanent European settlement) in such a peaceful bay. The Marsden Cross commemorates the first Christian sermon in New Zealand on Christmas day 1814. On a hillside above the cross were gravestones and information about the buildings in the settlement, none of which remain. After a most enlightening look around we made our way back (puff,puff!) and were all so glad to have had this opportunity. Thanks, indeed, Sue and Terry for a most enjoyable and educational outing. Dorothy Duirs Thanks for photos Mike. Gay and was delicious!! And enjoyed by everyone. Again calling by different bays and a commentary about them. When we were on our last section back it rained steadily for a short time, but that didn’t matter as we were now covering an area that was seen the day before. Everyone enjoyed the company of each other in the cabin. We arrived back at 7pm. It all comes to an end and we all left having met new people and made new friends. There will be samples at the Clubrooms to try on for size. BRIAN PARKER MEMORIAL RALLY SATURDAY 13TH APRIL 2019 ENTRIES CLOSE FRIDAY 5TH APRIL 2019 Format: The rally will start at Mangamuka Bridge at 11.30am and finish at Oturu School, followed by a social get-together at the VCC Clubrooms before dinner at 6.00pm. Bring your picnic lunch and afternoon tea. There will be gravelled sections Conditions of entry: 1. Vehicles must be entered by a financial member of the VCC Club of New Zealand. Traffic regulations must be strictly observed. Driving licences and membership cards must be carried. All vehicles must meet the required standards of the Club (clean, tidy and presentable). The use of computerised navigational equipment is not permitted in or on vehicles entered in VCC of NZ events. Mobile phones permitted in emergency only. Winner to be VCC eligible vehicle. We look forward to Members from other branches participating in this rally. In the event of the rally winner being from another branch a miniature trophy will be presented so that the major trophy remains with the Far North branch. ENJOY YOUR DAY! It is preferred completed forms be with the secretary by Wednesday 8th May. Nominations for all officers’ positions will be accepted from the floor as well on the night of the AGM being 14th May. I nominate …………………………………………………………………………………………………….. For the position of …………………………………………………………………………………………. Signature of Proposer ……………………………………………………………………………………. Signature of Seconder ……………………………………………………………………………………. I accept nomination for the above position …………………………………………………….